Travel like a pro! Whether for business or MSBL tournaments, Mercury Luggage lets you travel in style with custom MSBL embroidered luggage and accessories. Professionals from MLB, the NFL, the PGA Tour, and NCAA Colleges and Universities travel with Mercury Luggage, WHY DON’T YOU? Offering SPECIAL PRICING for MSBL Players, there has never been a better opportunity to upgrade to pro-grade luggage from Mercury Luggage. Don’t miss this opportunity — ORDER TODAY! Mercury Luggage, a preferred supplier of Major League Baseball, has teamed up with the Men’s Senior Baseball League. 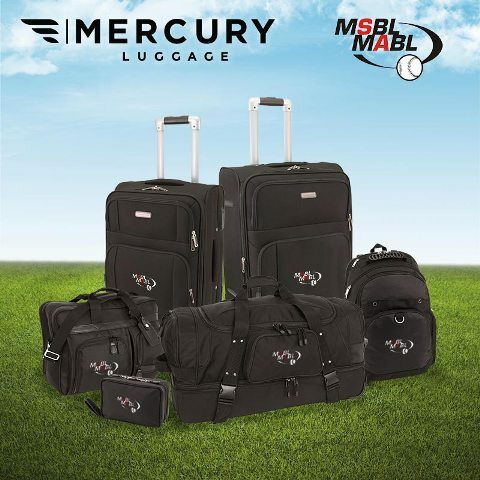 Mercury Luggage has created a limited edition MSBL travel collection just for MSBL members. Catch special MSBL pricing on embroidered suitcases, backpacks and more. Plus, many pieces can be custom embroidered with your team or league logos.